I am trying to find out more about a chap who was repatriated from Rennbahn, Munster. He arrived at Hull on or about 22 November 1918 aboard the S.S. Archangel. According to the family he was repatriated via Russia. Did the Archangel serve on that route? and is there a way to determine where she was during the month of November 1918? The ARCHANGEL (Official No.123940) was a 2,448-ton passenger ship built by J. Brown & Co., Ltd., Clydebank, Glasgow in 1910 and launched as the ST. PETERSBURG for Great Eastern Railway Co., Harwich. She was powered by two steam turbines that gave 20-knots. 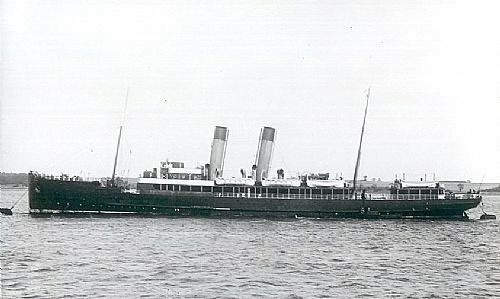 The ship was bombed on 16 May 1941, in position 57 55'N 02 03'W, and beached off Black Dog, 5 miles south of Newburgh, while voyaging from Kirkwall to Aberdeen, with troops & equipment. She was written off as a total loss. No idea where she was in November 1918 though? I know it is not quite what you are looking for but in the post I have just made the SS Archangel gets a mention (1939). Post is "Wartime Diaries". This is just what I was after. Also managed to track down a photo. Nothing on her movements in November 1918 but I suppose these things weren't well documented back then. Have you tried the Miramar ship index? The Great Eastern Society is also worth a try. Thanks for putting this picture on, I've just found out from the 202 MGC war diary that this is the ship my grandfather sailed to France on in 1917 with his unit.